March 17, 2017 March 17, 2017 mlbradford Carnage, Frickin' Quarnex Battery, History, King Kong, Movie Icon, Movies, Music, Nostalgia, Ray Harryhausen, Science, science fiction, Stuff that Matters, What Is Real? 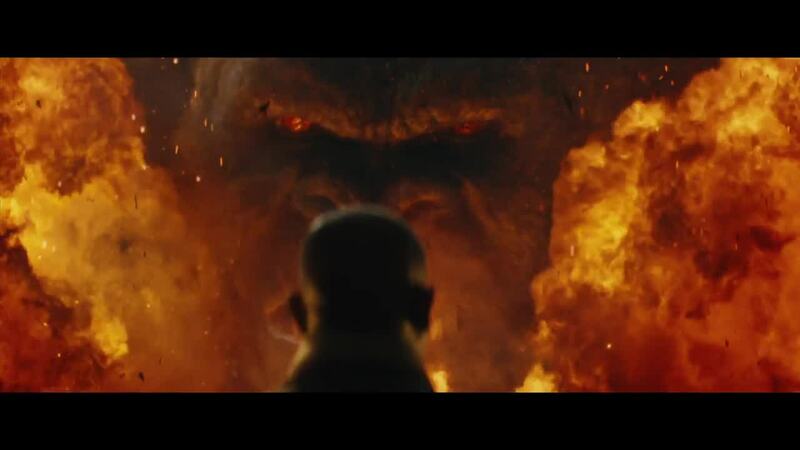 “My Kong is more of a god. He represents the unknown in the world. 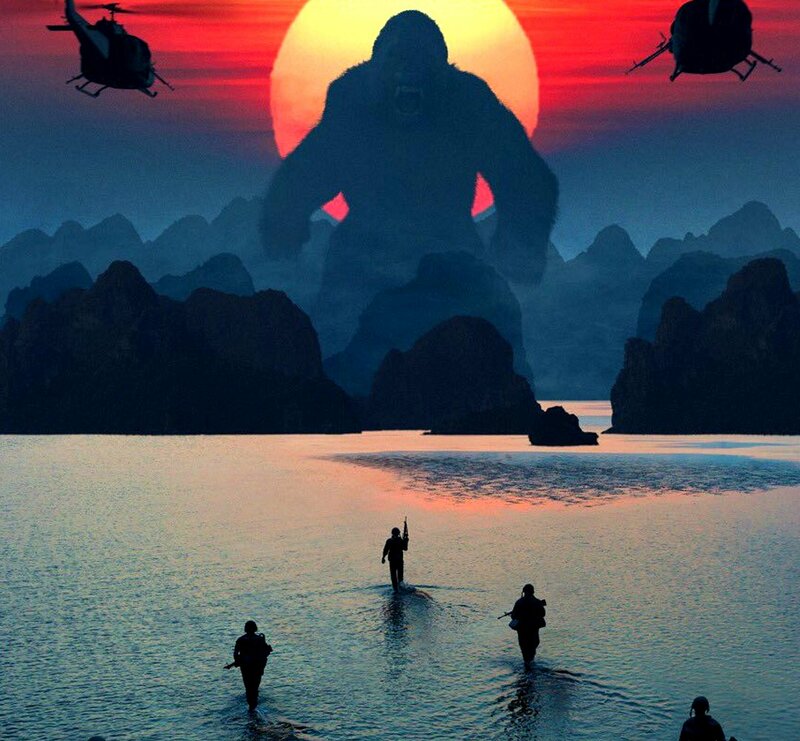 I wanted to make a movie that was as much about the big moments of Kong punching a helicopter out of the sky as the small lyrical moments” – Jordan Vogt-Roberts. “I don’t know that there was an alpha male pecking order. Although I did mess with the young guys. If they started up, I would go: ‘What’s your number on the cast list? '” – Samuel L. Jackson. 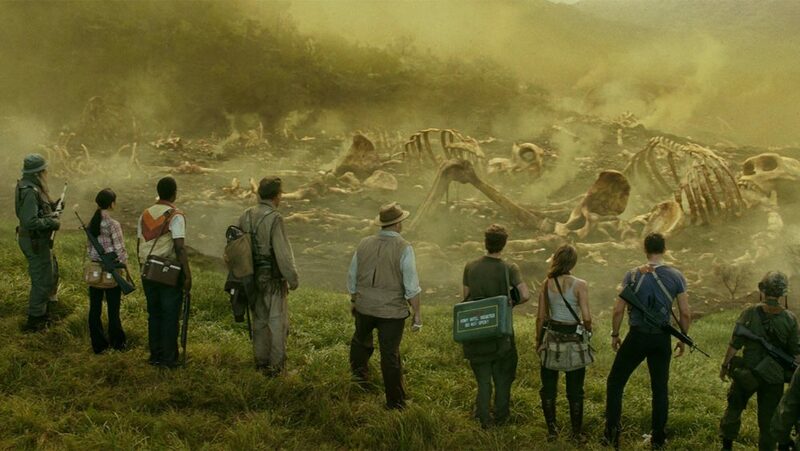 Must admit the opening sequence with Marlow crashing on the island back in ’44 looked like a neat set-up; considering how this character – played by the usually quite dependable John C. Reilly – could have been the one to bring in some much-needed comedy moments; alas, his performance became a tad too goofy for my liking. “Jordan told me he wanted to sneak an indie film into a blockbuster… [Conrad is] a hard, capable man who knows his way around a sharp object” – Tom Hiddleston. Upon viewing the first few stills from the movie, was amazed to see the crew armed with ol’ Armalite rifles; oho, methinks – going for a a retro feel here? 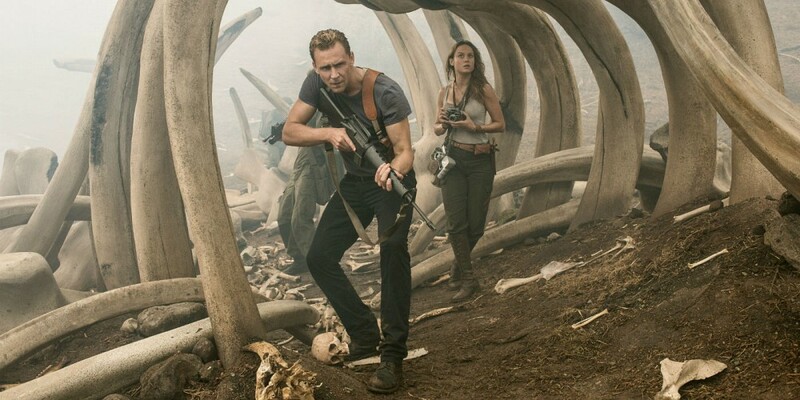 Only later did news break that Kong: Skull Island is actually set in 1973; does Tom Hiddleston have a phobia of flares and sideburns?! Absolutely no effort to immerse himself in the period! This setting, however, presents the opp to go for a groovy soundtrack: The Stooges! Black Sabbath! Vera frickin’ Lynn?! And of course, three of the most beautiful words in the English language: Creedence Clearwater Revival, with which we are treated to snatches of TWO of their awesome classics. Nice to have Bowie included as well, but all these tracks can be enjoyed in my own time anyway! Ho-hum, roll out the old monster-movie cliches: (un)naturally, there is yet another attempt to freak out any arachnophobes in the audience; the token pansyass official nerk who is inevitably consigned to meet a grisly end, and other fillers too numerous to mention. Gone are the sacrificial brides, but also woefully absent is – thanks to the CGI, here as abundant as the “lush” vegetation – any sense of terror or menace. Or excitement, while we’re at it. 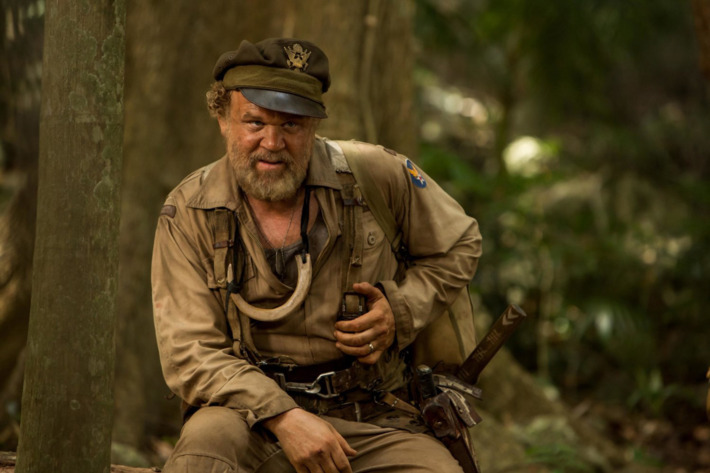 “John C. Reilly’s Marlow makes you feel like you’re watching a version of Apocalypse Now where Dennis Hopper’s been replaced by Fozzie Bear” – Larushka Ivan-Zadeh.